Do you ever wonder just exactly what goes into making synthetic grass? What goes into making your lawn stay green all year long? Sure, you may know the blades are made from products with really long names, but beyond that, what else is needed to create the final product? Quite a bit actually. 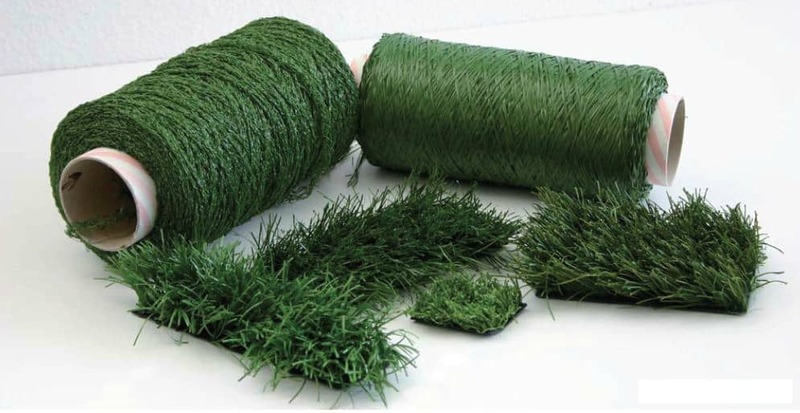 Let’s explore the process of creating synthetic grass for a few moments. We promise to make it as interesting and fun as possible. However, understand, these are general guidelines. Each product line may have its own particular nuance during processing, but the following information will yield a good understanding of the overall production technique. It’s kind of like making a cake in some respects. More on that in a few moments. Polypropylene: A long lasting and durable compound that is resilient by nature (it an often look like a plastic pellet). This is one of the main compounds used to make your grass blades. Polyetheylene: Another long lasting and durable compound, however, one that feels a bit more gentle against your skin than the one previously listed (again, this one can also look like a plastic pellet). Nylon: Most commonly known as “weed eater coil”, nylon also has a high burn tolerancee which makes it great for synthetic grass application. It’s use lends variety to the overall look and feel of your synthetic grass lawn (this compound may initially look like a pellet or rope). So you might be thinking at this point, “Wait a minute, is my lawn made of plastic pellets and weed eater line?” Yes and no, and yes again. That’s the short answer. The raw materials are what they are. What happens next begins the process of transforming them into the lush green space you know as your synthetic grass lawn. Let’s continue. Making Synthetic Grass is a Lot Like Baking a Cake? The next steps involve loading the raw ingredients into a hopper to be mixed. Coloring and chemicals are added to give the grass its particular shade of green, and UV protection is also added to prevent fading. Once it is mixed, the ingredients are transferred to a nice steel mixer where they are stirred until the product thickens. This is a lot like mixing ingredients for cake batter, but the next step ends the analogy… for a while anyway. The thickened mixture is then passed through an extruder (like the one in the image to the left) turning it into long strands that resemble blades of grass. Your synthetic grass product is beginning to take shape! After this step the material is put through a machine that winds the strands into a loose rope. From there, they are tightened further, and woven into yarn. Finally, the strands are ready to be heated. This step is crucial because it sets the blade shape. If this step was left out, your lawn would look like very fake. From there the journey continues. The yarn is sent through a tufting machine where your lawn material is pierced with needles to create the nice grassy surface you will enjoy. The best way to think of this step is a combination between sewing and latch hook. If you did one of those latch hook kits as a child, the tufting process works much like that, only a lot faster. Hundreds of stitching rows are made during this step. After your synthetic grass is tufted, it is ready to receive a backside application. Most of the time, latex is used. It is the best choice for creating a flexible, durable end product. After this, we can return to the cake analogy, albeit briefly. The final product is passed through an oven to cure the latex backing. After a cool down, your synthetic grass product is complete. The only step to be completed is packaging for sale or delivery. Keep in mind, this is the general method used to produce synthetic grass. Variations and slightly different methods may be used for some grass products. Making synthetic grass is as much an art as it is a science. However, what we just described to you is the culmination of 50 years of synthetic grass production. This general production method represents the third reinvention of the production technique, or third generation synthetic grass. So what does that mean? The process is now more efficient, which stabilizes the final cost of synthetic grass products for you the consumer. The other benefit? A more realistic looking lawn. Making synthetic grass today results in a far different product than what you would find used in early applications like the Houston Astrodome pictured below. 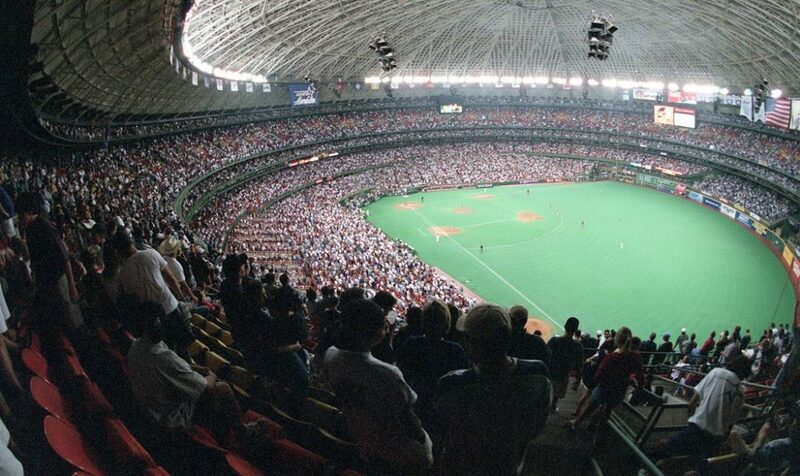 The Astrodome in it’s final days, circa 1999. 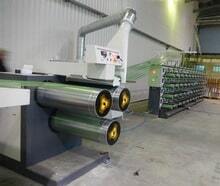 Third generation production also means UV coating and tolerance for wear and abrasion. The use of polypropylene is a huge improvement too. This compound is exclusively used for the extra thatch layer. Cushion and support are direct benefits of this compound being added into the mix. This is really noticeable on big applications like the Dreamforce install performed by Artificial Grass Pros in the fall of last year. It just goes to show there are turf products to suit just about any application you can think of. NewGrass prides itself in being able to offer a wide assortment of synthetic grass to suit your taste. Our product line is current, realistic looking and durable. We only sell products that pass our curation and quality control standards. Anything less does not make the cut. This means you enjoy a product that we can place our full confidence in, so much so that we offer a 15 year warranty. After all, what good is an efficient production method if you lack confidence in the final product? If you are in the market for a new lawn, we would love for you to consider NewGrass synthetic grass products for your installation. We have the selection, and staff, to help you make the best choice for your lawn. So really that means one more step in the production process. You. Contact us today. We would love to close our production loop with another valued customer.